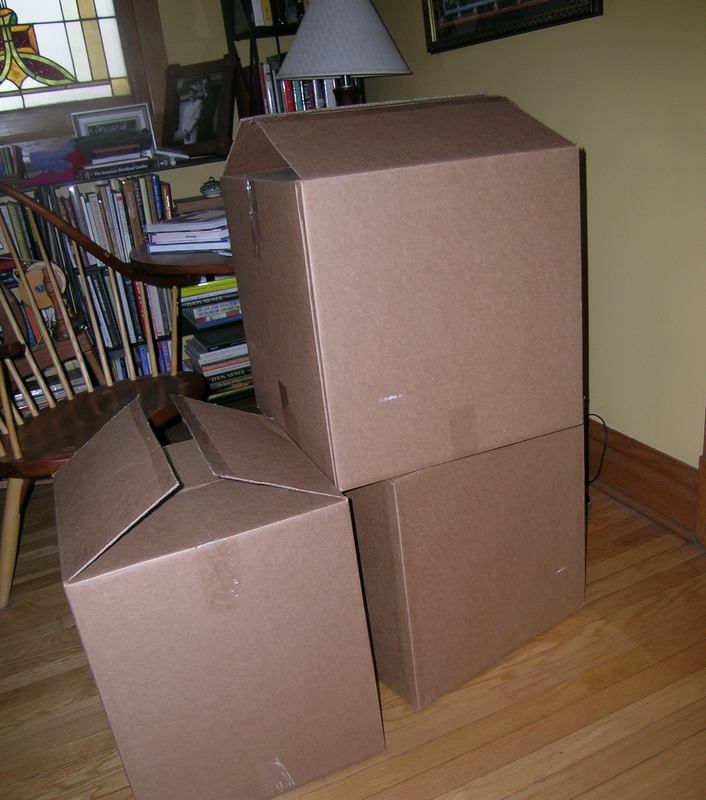 3 boxes full! Last post I was talking about lots of color, this time it is just lots of wool filling up my entryway. Remember the lamb fleece that I was given earlier this year, a combination of Hampshire and Suffolk lambs? 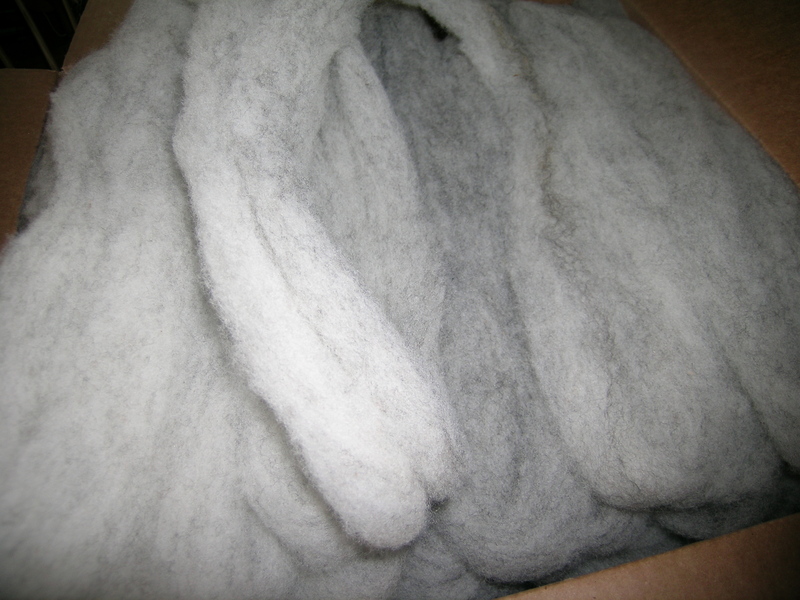 While not normally a spinner’s go-to fiber, my resource books tell me that they are often over-looked by spinners and make a great yarn even though the sheep are raised mainly for the meat. 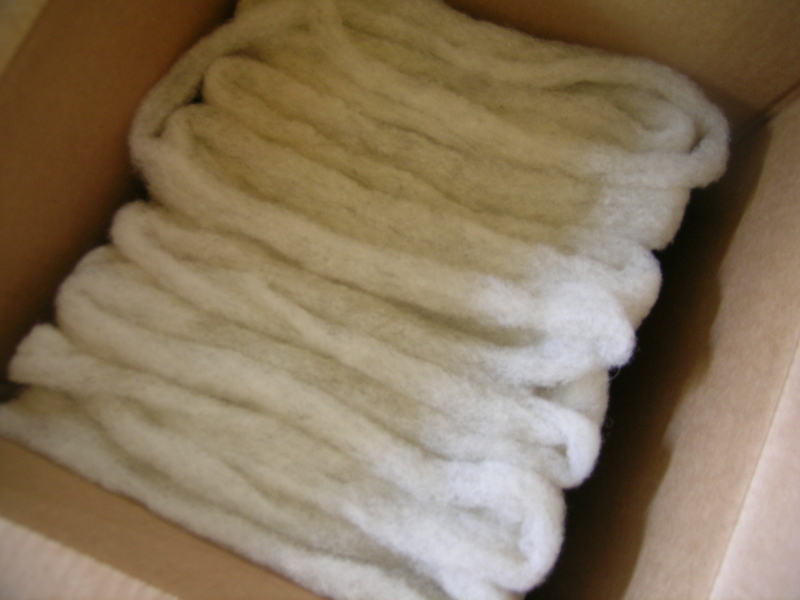 The Illinois Wool and Fiber Mill was processing it for me, and I thought that I would not have it until this Fall. I was on a scouting trip with a friend of mine for her tour company, City Ventures, which is taking a trip to this mill and Trudi’s Farm this fall (an amazing sustainable farm with beautiful gardens and orchards and a wonderful Salvage Hall all made with recycled materials), I hope that I am available to attend this trip. When Pam mentioned that I was coming along for the preview, Jane made sure to finish up my roving. Not that I needed it. And 1 box of a beautiful grey. I think more than enough to spin for a sweater! 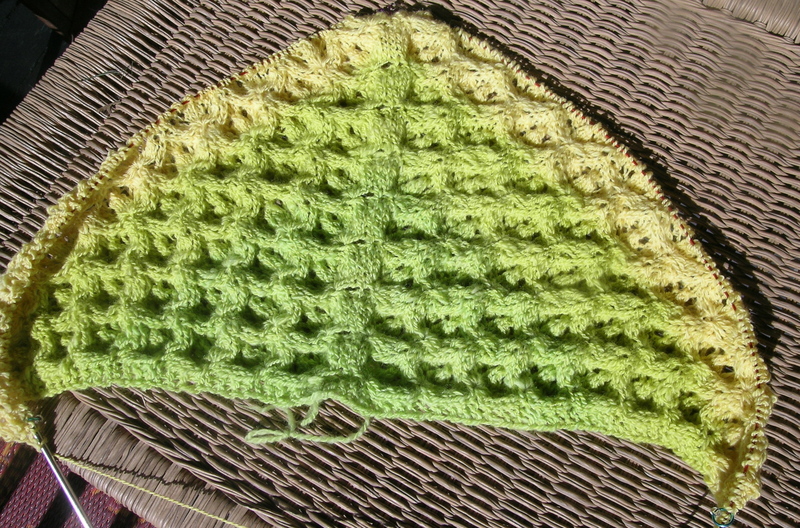 On the knitting front, I am making progress on my Echo shawl, using a gradient from Fiber Optic, Blush to Celery. I have learned a lot since spinning this, I have 2 balls of gradients. In the future, I will spin The two braids without splitting them, and then ply those together to get a much longer gradation. This shawl will go from Celery to Blush then back to Celery. While in Marengo, we stopped off at The Fold, as I was in need of size 5 long circular knitting needles to continue this shawl. Hoping to get some Lantern Moon needles, Tony had these ChiaoGoo metal needles to offer instead. I am not normally a fan of metal needles, but these may have changed my mind, the point is very sharp for lace work, and in this shawl trying to K3 tog with a 9 stitch increase is a challenge. While I have only knit a few rows using them, I am liking the way they work very well. Toni also graciously loaned me some signature size 1 DPN’s to try until the Midwest Fiber and Folk next week. Amazing since, she offered out of the blue, barely knowing me—and they are very expensive. Will have to think of something special to take back with them…perhaps some homemade jam. I love the trust and honesty that I continue to find in the knitting/spinning world. I am just totally in love with the shawl.. I can see the colorwork and your stitch work and it is going to be stunning! Thanks! It is really knitting up very pretty, mostly due to the amazing fiber that I had to work with.